Cleaning routine? No thanks... lol My hubby is the cleaner and laundry doer. I run the errands and cook. I do clean some... but he does the majority of it. 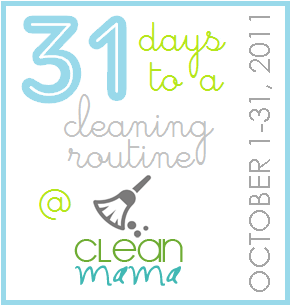 oooh i need to check out the clean mama thing. thanks for the link!! thanks for linking up!! sorry i am sooo slow getting here, life keeps getting in the way! OH, i also wanted to let you know that the My Happy List link party is moving to Tuesdays starting October 11, i would LOVE for you to play!